Singapore Airlines is the national carrier of Singapore and operates a number of flights throughout the Asia-Pacific region and the Americas. Singapore Airlines is currently one of the top ten largest airlines in the world in terms of passengers carried and is a member of the Star Alliance with partners such as Lufthansa, United Airlines, and Turkish Airlines. Singapore Airlines has received exceedingly positive reviews from past flyers thanks in part to its sterling fleet of Airbus a380 aircraft. 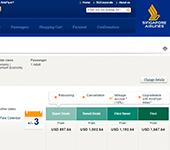 The Sinapore Airlines website is somewhat complicated at first glance but thankfully offers a simple line-up of buttons in the header to help travelers find the information they need. The are clear tabs to check flight status, complete an online check in, search for flights and view the details of one's reservations. 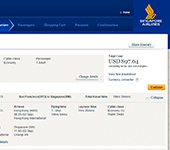 In the “Travel Information” section, flyers can find complete information on Singapore Airlines' baggage allowance policy (2 pieces of checked luggage for flights to the United States and Brazil and up to 30kg of free checked baggage for all other flights). 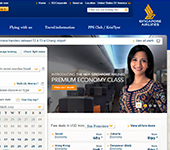 Singapore Airlines has also made a name for itself thanks to the quality of its premium cabins. Singapore Airlines' Business Class offers spacious leather seats which recline into full beds and its First Class cabin offers private modules, full beds, and gourmet meals. Most notably, Singapore Airlines also offers First Class Suites featuring full beds, first class meals with paired wines, and 23-inch LCD televisions. Where is Singapore Airlines located?